The affair prompted speculation that the alleged blackmail – and the whole ongoing spat between Bezos and the Enquirer – might have been “politically motivated” and that a certain “government entity”might have been involved. It’s not often that I read a book, mark it up on every page, and listen to the audio recordingto boot. Capitalism in America is a delightful romp through the 400-year economic life of America from agricultural giant to industrial juggernaut to information/technology revolutionary. Stories and statistics sparkle on every page. But the book is more than a history. It is a policy guide to make sure capitalism in America flourishes like never before. What is forgotten in this analysis of the book by Alan greenspan — the fellow who sweet-talked presidents when the GFC was looming large — by Mark Skousen (a Presidential Fellow at Chapman University, recently awarded the Triple Crown in Economics) is that WAR AND THE ENDLESS PLUNDER OF THE MIDDLE EAST (and other countries) plus the exclusivity of the DOLLAR (Annuit coeptis [meaning "favours our undertakings"] and Novus ordo seclorum [meaning "new order of the ages"]) through the (PRIVATE) Fed Bank, funded a lot of this "prosperity". At this stage we cannot leave aside the then new sermons on the mount of consumerism: ADVERTISING — in which our Mr Gundlach was an expert at, including satirising his own trade. Amazon, the e-commerce giant helmed by the world's richest man, paid no federal taxes on profit of $11.2 billion last year, according to an analysis of the company's corporate filings by the Institute for Taxation and Economic Policy (ITEP). It is the second year in a row the company has enjoyed a negative federal tax rate on a multibillion dollar profit. That would place the company's effective federal tax rate below the rate paid by the poorest 20 percent of American households, which had an effective federal tax rate of 1.5 percent in 2015, according to the Tax Policy Center. "Amazon pays all the taxes we are required to pay in the U.S. and every country where we operate, including paying $2.6 billion in corporate tax and reporting $3.4 billion in tax expense over the last three years," said an Amazon spokeswoman, Jodi Seth, in a statement. "We have invested more than $160 billion in the U.S. since 2011, building a network of more than 125 fulfillment and sortation centers, air hubs and delivery stations as well as cloud-computing infrastructure and wind and solar farms." Amazon founder Jeff Bezos owns The Washington Post. As you know, Aussie Telcos have to keep your records of your transmission of insane emails, naked pics, tricks to con old ladies to give up their cash and your boring e-conversations for at least two years for the government to study the stuff you drop in your toilet bowl in detail. Overall this could seem like hard work. Fear not. Not only the Telcos can easily keep the record of your outgoing and incoming emails, they can also record YOUR DRAFTS. How do they do that? Simple. Instead of the old protocols that used to work well in doing "secrecy", they have created a new "protocol" between their storage and your computer. Whatever you do, the new protocol steals from your desktop "secretly". No need for anyone watching — it's done automatically. I won't tell you how to bypass this abomination (this would reveal the loopholes), but it's possible... Find your own way. Good luck. Between the total collapse of the Covington Catholic story and the embarrassment of the Jussie Smollett hate hoax, 2019 has been a rough year for America’s embattled mainstream media. Now, the hostility toward these supposed guardians of democracy that provided some of the energy behind Donald Trump’s 2016 campaign is about to get its day in court. 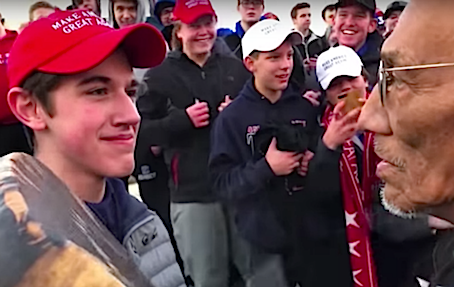 Nick Sandmann, the 16-year-old Covington student who was accused of willfully intimidating the Native American activist Nathan Phillips at this year’s March for Life, has filed a defamation lawsuit against The Washington Post, requesting $250 million in damages. The court filing, which is available online, is a fascinating read. My first question was how Sandmann’s lawyers came up with the figure of a quarter of a billion dollars, and the document duly provided an answer: it is “the amount Jeff Bezos, the world’s richest person, paid in cash for the Post…in 2013.” This lawsuit is not about Sandmann’s lost opportunities or mental anguish. It’s about “punish[ing], deter[ring], and teach[ing] the Post a lesson it will never forget.” That kind of rhetorical melodrama seems aimed at journalists, not judges. The goal, quite literally, is to take the paper for everything it’s worth, and make a big splash doing so. Nor does the combative language end there. Sandmann’s attorneys accuse the Post of “wrongfully placing the anti-Trump, anti-Catholic, and [pro-choice] agenda over the harm its False and Defamatory Accusations caused to Nicholas” and of ignoring “contrary information in favor of its pre-conceived false narrative against President Trump and his supporters.” Sandmann’s name might be at the top of the complaint, but the attorneys who authored it clearly imagine their lawsuit is carrying the banner for every single victim of anti-MAGA discrimination. Most of the complaint is devoted to listing and refuting all of the “False and Defamatory Accusations” in an exhaustive and highly repetitive manner. Taken together, the evidence is damning, even if it seems a bit exaggerated at points (such as the insistence that the Post’s seventh article on the incident, which seemed fairly balanced to me, was still defamatory). Yet the complaint’s bellicose and overtly partisan language, as well as its reliance on the right-wing persecution complex, made me uneasy. So I decided to re-read the Post‘s first story on the Sandmann-Phillips incident. After all, it couldn’t be that bad. Oh, but it was. Even the headline—“Native American drummer speaks on the MAGA-hat wearing teens who surrounded him”—was false, and has since been updated to say that Phillips “speaks on his encounter with MAGA-hat-wearing teens.” The version of the story currently available on the Post’s website also includes a correction, acknowledging that they made a mistake in publishing Phillips’ misleading statement about having served in Vietnam. Both of these factual errors are unforgivable. As the court filing points out, unedited video of the event was available at the time the story was published. The reporters who wrote the story simply didn’t bother to look for it. Even after the corrections, the updated version of the story still describes Sandmann’s expression as “a relentless smirk” and retains several of Phillips’ statements, such as his claim that the students blocked his way and chanted “Build that wall.” They also include the sappy and totally irrelevant detail that, as he beat his drum, Phillips was “thinking about his wife, Shoshanna, who died of bone marrow cancer nearly four years ago.” The roles of hero and villain were already cast. From there, the article degenerates into a something akin to the murder of Jon Snow in Game of Thrones, as people and groups come forward one by one to sink their knives into Sandmann. Democratic Congresswoman Deb Haaland, Democratic Congressman Tim Ryan, Covington Catholic High School officials, the Diocese of Covington, the mayor of Covington, the guy who started an online petition to fire the principal of Covington Catholic (for God’s sake! ), and the Indigenous Peoples Movement all get their turn. And, for good measure, we also get a paragraph about Trump’s taunting of Senator Elizabeth Warren and a Post denunciation of the March for Life. From the sheer scale of this pile-on, you’d think Sandmann had shot up a school. If there was any attempt by these reporters to get Sandmann’s side of the story or talk to anyone who was with the Covington group, the article gives no indication of it. This is shoddy journalism, pure and simple, and it’s especially disappointing coming from a paper still basking in the light of Steven Spielberg, Tom Hanks, and Meryl Streep. It is not necessary during the interrogation to look for evidence proving that the accused opposed the Soviets by word or action. 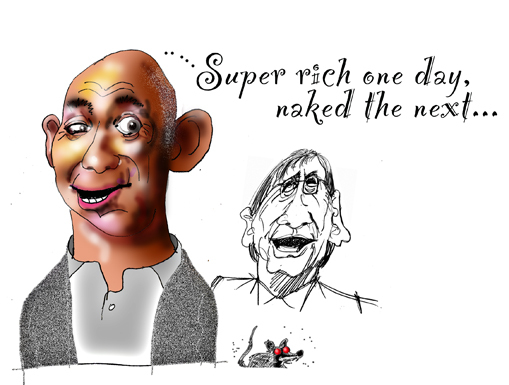 The first question you should ask him is what class does he belong to, what is his origin, his education and his profession. These are the questions that will determine the fate of the accused. Trump, despite his bluster, has made no real attempts to muzzle the “fake news media,” but he is cheering on this lawsuit. Now it looks like the Post‘s hatred of the president and his supporters could lead to disaster to the tune of $250 million. Either way, this has the potential to be the biggest court case of the Trump era.